Old World Elegance by Timberlin Homes located in Grey Oaks subdivision SW. 1 1/2 story manor with 4-Car Garage and full basement. "Huge" Open Kitchen with Wood Ceiling and Dining Area (19' x 24') opens into the 14' High Coffered Ceiling Great Room. Master Bedroom has a step ceiling - Master Bath includes a free standing tub along with a ceramic shower. Study has double pocket doors and a window seat. Coming off the 4-Car Garage is a large Mud Room Area with Lockers - Ample Pantry off the Kitchen. 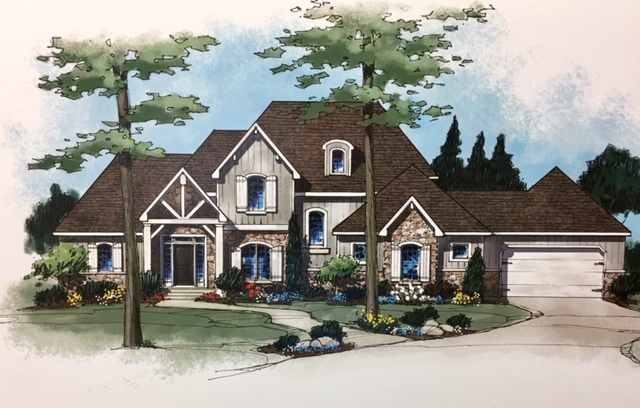 Finished basement includes a 35' Family Room, Theatre Room, 5th Bedroom/Flex Room and Full Bath and a very nice wet bar area with island and pantry - plenty of storage also. The front elevation of this home is not only prestigious but very elegant. Call if you'd like more info and would like to sit down with the decorator to go over colors.